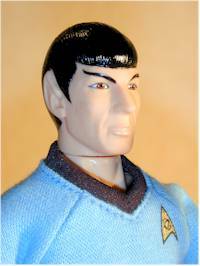 It seems like years ago that Playmates was successfully producing their Star Trek figures. Actually, it was. So why review figures that are this old? One word - clearance. 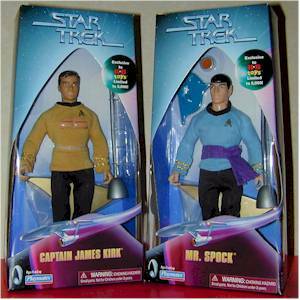 These are the limited edition (5000 produced) of the Captain Kirk and Mister Spock figures from the episode 'Amok Time'. Originally, these sold for $30 - or was it $40? At that price, Playmates was sticking it to the fans. But now, long after the license is history, these are being clearanced at www.kbkids.com. For $9.99 each you can have these, or one of several other 9" Trek figures. The boxes weren't bad. Yes, you can't remove the figure without destroying them, but they colors were bright, the boxes withstood shelf wear well, and the figures display well in the boxes. When this 9" body was first produced, they weren't too bad compared to the rest of the industry. With neck, ball jointed shoulders, elbows, knees, and hips, they were certainly better than the competition. Unfortunately, the competition passed them up and they never reacted. I can live without ankles, but waist and wrist is an absolute must. Both figures where the same uniforms that were used numerous times. Spock has the addition of the sash from the episode, and Kirk's shirt is cut as it was by Spock during the battle. The red cut is also present on his chest. The strength of the 9" line was the terrific sculpts. 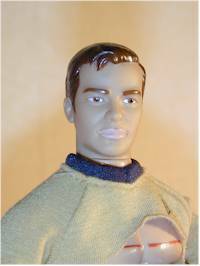 Both of these likeness's are excellent - unfortunately, Kirk's is hurt somewhat by the heavy color on the lips. 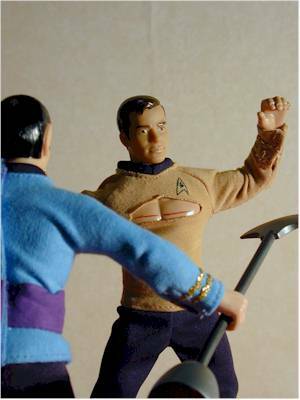 Both of these figures, like all of the 9" Trek figures, come with basic stands. 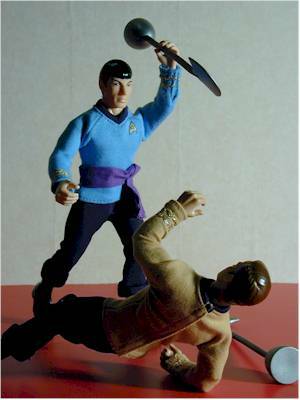 They also both come with a Lirpa, the first and most famous dueling weapon used by Kirk and Spock in the battle with each other. 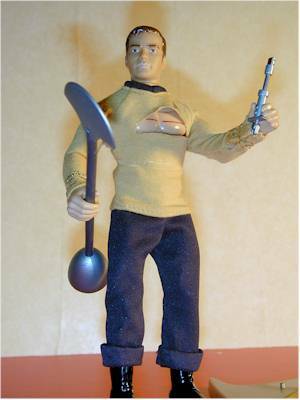 Kirk also comes with the hypodermic that McCoy used to inject the drug that made the Vulcans believe him to be dead. 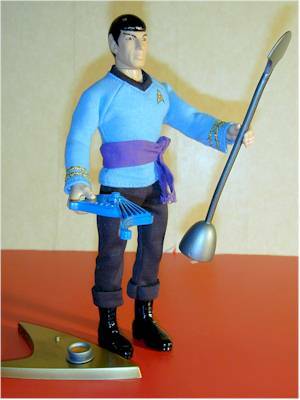 Spock comes with his Vulcan harp, which he played during the episode, and his bowl of soup, which he threw at Nurse Chapel at the very beginning of the show. This is an excellent example of appropriate accessories - these were things actually used in this particular episode. For those of us who bought these the first time at three or four times this price, we were burned. We knew we were, of course, but we took what we could get. Now, at $9.99, these guys are a steal. These figures are a great value, and the sculpting and accessories wonderful. The big negatives are the lack of wrist, ankle and waist joints, and that makes it tough to get good poses. I've put a couple pictures below that reinact a couple moments from the battle, but for the most part the figures can't even hold the Lirpa's properly. Without the wrist articulation, they can't hold the weapon in both hands. But if the wrists had been articulated, these figures would have been near perfect.